The bat walk on the 5th September was absolutely brilliant. 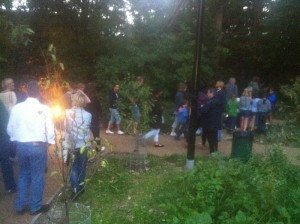 Thirty five people came.. lots of new faces and some very enthusiastic young wildlife lovers. 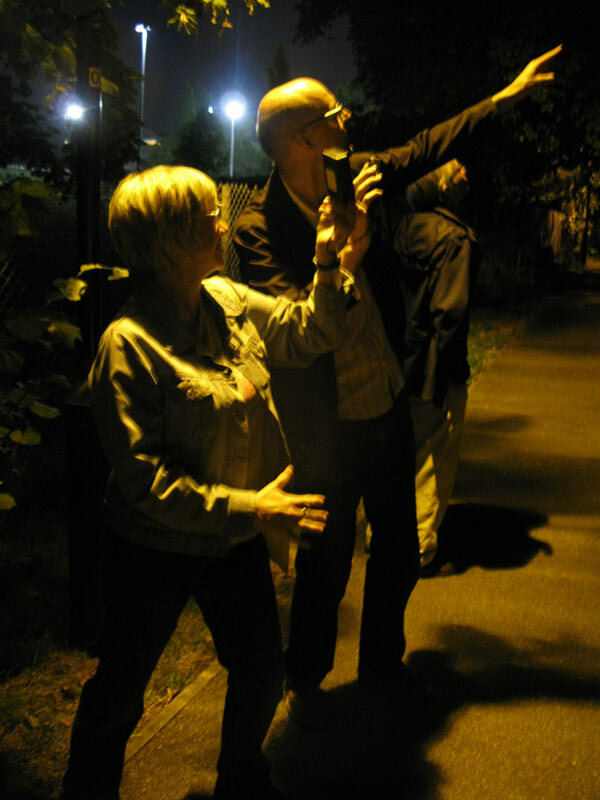 Daniel Greenwood from the London Wildlife Trust (LWT) brought three bat detectors with him. “Bats use high frequency calls normally beyond the range of human hearing to build up a sound picture of their surroundings. This echolocation system enables them to wing their way through the dark night hunting the tiniest of insects. A bat detector makes these echolocation calls audible to humans – and because different bat species hunt different prey and are different sizes, they make different calls which can help identify them.” (unasahmedly stolen from the Bat Conservation website). For example, the common pipstrelle bat can be found on a radio frequency of 45Hz whereas the soprano pipstrelle can be heard on 55Hz. Noctule bats are heard at a frequency of 30Hz. So by tuning the bat detectors in to different frequencies, you can tell which bat is flying overhead. We walked around DKH Open Space for about half an hour with no sign of any bats… we then headed into the wood and again no sign of bats. Disappointed we headed off for a walk around the area and it was on the Green Dale path that we struck gold… lots and lots of bats flying around, eating and making a terrible (inaudible) racket. Everyone was hooked and we continued our walk along the path that runs along the bottom of the astro turf pitch. Again lots of bats (3 kinds: common pipstrelle, soprano pipstrelle and noctules – we think). Interestingly all bat activity stopped when we passed the floodlights of the astro turf football pitch. It seems as if the lights were too strong and they prefer the orange glow of a streetlight. 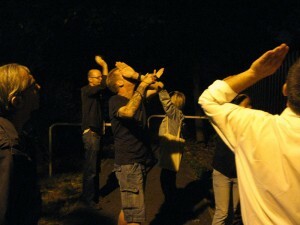 We descided to head back to DKH Open Space to see if any bats were there now that it was dark. 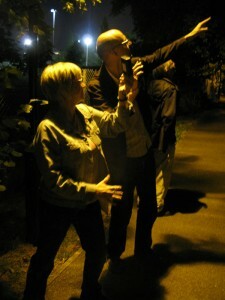 Sure enough we dected two types of bat on DKH Open Space: soprano pipstrelle and the common pipstrelle. We even saw them flying around above our heads. We then went back into the wood and again we detected some pipstrelles. There’s a good chance that they are using the bat boxes in the wood and we should get a bat inspector to come along and have a look before they hibernate. Bats eat about 3000 insects every night! For more bat information please visit the Bat Conservation website.